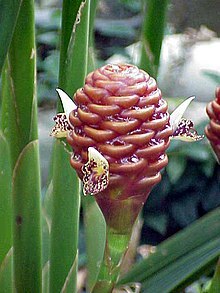 The genus Zingiber is native to Southeast Asia especially in Thailand, China, the Indian Subcontinent, and New Guinea. It contains the true gingers, plants grown the world over for their medicinal and culinary value. 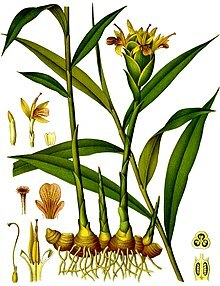 The most well-known is Z. officinale, garden ginger. 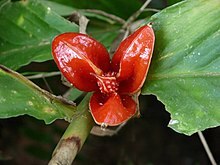 ^ "Species New to Science: [Botany • 2014] A Key to the Genus Zingiber (Zingiberaceae) in Thailand with Descriptions of 10 New Taxa | พรรณพฤกษชาติ สกุลขิง ในประเทศไทย". 2014-07-24. ^ Flora of China v 24 p 323, 姜属 jiang shu, Zingiber Miller, Gard. Dict. Abr., ed. 4. vol. 3. 1754. ^ Govaerts, R. (2004). World Checklist of Monocotyledons Database in ACCESS: 1-54382. The Board of Trustees of the Royal Botanic Gardens, Kew. ^ Tripathi, S. & Singh, K.K. (2006). Taxonomic revision of the genus Zingiber Boehm. in North-East India. Journal of Economic and Taxonomic Botany 30: 520-532. ^ "Flower notebook: Zingiber". Kalani Tropicals. Retrieved November 11, 2011. 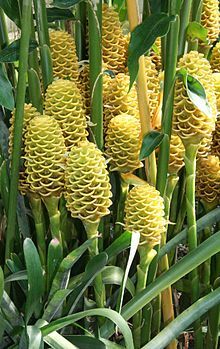 ^ "Zingiber". The Plant List; Version 1. (published on the internet). 2010. Retrieved November 11, 2011.